Not all varieties of slowness are created equal. If computer-to-computer file transfers or Web page loads are bugging you, consider focusing on your wireless network configuration instead of mucking about in Windows or inside your computer case. Here are some common ways to give your computer a boost by scrutinizing the network side of the equation. Upgrade everything to 802.11n: Upgrading to a newer router will help--but only if all of the equipment on your network supports it. A new router plus an old laptop won't increase your performance much, unless you're on the outskirts of the wireless connectivity zone, in which case you may achieve better performance simply because the new router's signal is stronger. If you want to obtain the best throughput from an 802.11n class router, you must use WPA2 encryption (or no encryption at all): The older WPA encryption operates at half the maximum theoretical speed that 802.11n offers. Tinker with the antennas: By far the easiest way to alter your network's performance is by moving the antennas on your router, if it has visible ones. Try different configurations--all straight up, bent to 45 degrees, aiming to the side, or combinations of the above. Depending on your router, antenna tweaks can give you a boost of up to 20 percent on network throughput. You might move your router, too. Many users seem to think that once a router is installed, it needs to stay put. Not so: A cable modem can connect to any functioning cable outlet, and a DSL modem can connect to any phone line. The rule of thumb is to position the modem (and router) as close as possible to the location where computers will be used most frequently. If you have computers set up throughout your house, try to place your network equipment as centrally as you can. In too many installations, the modem and router are locked in the basement, where distance and interference combine to slow the network down. 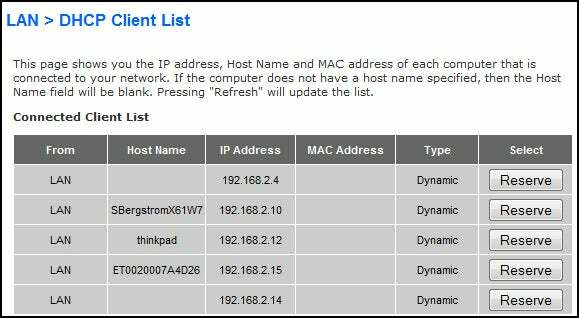 If your DHCP client list includes entries you don’t recognize, uninvited users may be hogging your bandwidth. Check for interlopers: Network performance suffers when numerous devices use the pipe simultaneously. You can monitor your own Internet usage, of course, but what if you aren't the only person using your connection? To determine whether interlopers are freeloading on your network, consult the DHCP client list in your router's configuration tool. Most such lists identify everything connected to the network, including MAC addresses and computer host names. Don't be alarmed if you see more devices than just your laptops and desktops: Wireless printers, networked home-theater equipment, media servers, smartphones, and other wireless gadgets may appear in the list. But if you find something that shouldn't be there, consider upgrading to a higher level of Wi-Fi security, and change your administrator password and encryption key. Get your traffic in shape: If you're up for some advanced network tweaking, consider traffic prioritization for your router. Traffic prioritization-aka traffic shaping-is a technology that en­­ables you to tell your network to let one form of traffic have precedence over another. For example, you may want to give voice and video the highest priority, so your video calls go through with no lag and stutter, while giving e-mail and file downloads lower priority be­­cause they are less sensitive to delivery delays. These days, more and more routers are adding Quality of Service features. Look for router models designed for gaming use or for "experts," such as the D-Link DIR-655, and then venture into the QoS (Quality of Service) settings in the product's configuration menus. True experts may also consider downloading third-party firmware for popular routers such as those in the Linksys line, to add QoS feature support to their network routers.